A game in China, and more outs that make life hard for us. But hey, what fun would Fantasy be if everything went right for us every week! And if it didn’t all go wrong we wouldn’t get the chance to Scramble!!! Welcome to China! Well I guess there is a sign somewhere in the airport there that says that, as for me, well I am still here in Adelaide hoping that my team aren’t disadvantaged by playing over there this weekend. Speaking of disadvantaged, that pretty much describes my Fantasy Teams this week. There are blokes going down all over the place and they are forcing me to look at trades that I would generally have no interest in at all! Thankfully we get one back from suspension to offset those we lose to injury this week. Well, I don’t know how to say it in Chinese so I will stick to English (which some people say I struggle with sometimes)….. Let’s Scramble! It’s Rookie Cullin’ time…. or is it? We have now reached that point in the season where there are a lot of our rookies that have reached their peak. How do you know when they have reached their peak? Well if their BE is up to their average or not far from it such that they are about to start dropping in price. However, do you really have to trade them then? If you listened to The Traders podcast this week, the boys discussed an interesting thing, that is, you may want to keep a couple of your rookies to use them through the bye rounds. Now on the face of it this is a good idea, but there are some caveats on this that you have to think about before you keep them. One of the key criteria for me on this one is that you only want to consider a player who is scoring consistently well for this. You don’t want someone that is going up and down such that their price is fluctuating and you don’t know what you are going to get. So you wouldn’t be looking at someone like Hampton for this, but a player like Marchbank who has been pretty consistent would be one that you would look at keeping as cover in the byes. Secondly you would want to make sure that it is a player that has good job security. You don’t want to put your eggs in a basket that might get dropped. Once again, a guy like Marchbank doesn’t look like getting dropped but a player like Nic Newman who has been in and out or Barrett who has been doing the same wouldn’t be as good. Now having said all of that, with the way teams have come out last night, you may need to keep some as you may have bigger issues! So, we have been worried about it all season and next week it is going to be upon us. In round 9 we have our first byes of the season. Port and Gold Coast won’t be playing next week. But as we all know, the rules don’t change. This will be a standard week in all forms of the game. Not best 18 or anything like that, it is a regular week with best 22. You may want to start doing something about that this week if you have too many of these boys in your side. If you are anything like me you are usually trying to plan your trades a week or two or three in advance. Obviously plans change, but if you are doing this you are already working out how you can navigate the bye rounds and field your best line ups. That first week of the byes seems to be the most dangerous one with Sydney, Bulldogs, Carlton and the Lions in it which will take out players like Hanners, Parker, Buddy, Macrae, Dahlhaus, Bontempelli, Marchbank, Docherty, Simpson, Murphy and of course Rocky. It is going to be a tough one as those guys are in a heap of teams this year. But plan as we might we just can’t do much about random dropping of players or injuries, so do your best but make sure you are flexible. I don’t know about you, but I had my weekly trades all planned, then we get the news that Treloar might be out and that screwed me, I thought, hey, he will be ok, there is always rumours like this. All jokes aside though, it is good for us that he has been named as an out and wasn’t withdrawn late. This at least gives us a chance to plan and get things organised. For me, in RDT and SC I will be holding him. We don’t know how bad he is and it is likely he will come back after one week. In AF however, that is a different story, I am trading him there partly because my bench isn’t looking good, but really that is the way that game has to be played, you can’t afford to leave studs on the bench because everyone else will pull away from you by trading him out. I was planning to use Harley Balic as some cover for me this week, but he is apparently sick. Not sure what with, but if I can I will be trying to hold him. He has plenty of cash to make still and deserves to still be in your side. I am worried about Nic Newman though, he dominated in the NEAFL on the weekend but is only listed on the extended bench this week.I am not overly confident that he will make the cut. He will be an important one to see what happens on Friday afternoon. Fellow Rookie Hugh McCluggage being rested isn’t a huge surprise. He wasn’t lighting the game on fire either. On the positive side of the ledger Zac Fisher is back which might help some with cover but don’t rely on him to deliver a big score against the Saints. Houston being out means he has to go this week, given his bye is next week. Those that played Geelong roulette last week with Black and Parsons better not have bet on Black as he is out this week Omitted. Despite Parsons putrid Fantasy score he remained in the side, hopefully he can return to the form he had before he was suspended. Brent Stanton being dropped won’t bother most coaches…. except Warnie. But it is good to see McGrath back. For those on the David Swallow train, it is time to pull into the station and get off. Out again with a knee injury, He can’t get any consistency in his games and seems to be permanently injury prone, which is a shame because he certainly can play. Speaking of chronic knee injuries. Jaeger is still out and now they are saying they don’t know when he will be back, based on that info I would have no hesitation in pulling the trigger on him. Great news for those with Grundy, now that Cox has been omitted we may see Grundy back to his normal level of output this week. We have been waiting for it so hopefully he can deliver for us. This is the last game for GC and PA players before their bye in round 9. Be prepared. Treloar is in a heap of teams, so you won’t be the only one with this issue this week. Just look to see the best strategy that doesn’t compromise your longer term goals. Check the late ins and outs this afternoon. Particularly if you are a Newman owner. There you have it folks, this is going to be yet another challenging round. There are plenty of pitfalls and unknowns but as usual we will just have to roll with the punches and see what happens. Remember, it isn’t just you, heaps of other players have the same problems with their teams. All the best to those of you that made the trek to China for the game on Sunday, hope it goes really well and that GC and Port put on a good show (but Port put on a better show hopefully and get the win). Keep an eye on the byes when doing all of your trades this week, only a couple of weeks to go now until the first one. Apologies that I didn’t get to answer any questions this week, I have been very busy but I will get back to questions again next week. I know I always say it but I love seeing in the comments later in the day when I get a chance to look that you have all been helping each other out. 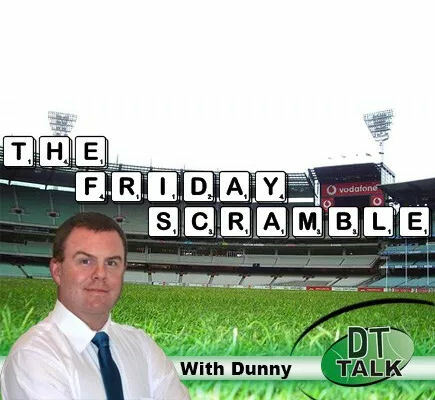 I can’t get in there in the mornings on a Friday very often to answer questions but it is awesome that the DT Talk community come together to help answer each others questions, and rarely do I see any bad advice, it is usually spot on the money, so keep it up everyone. Which rookie is must grab this week? Myers, Lloyd, Melican, Schee, O’Conner? Fellas which is the best option?